Humanizing the candidate experience is important because it’s your first opportunity to let a candidate truly experience your culture. You are showing each candidate what it means to work at your company through the company values that are woven into your hiring process. Colleen Finnegan is all about B2E (business to employee) marketing – creating authentic, consistent, and impactful marketing campaigns and events that are reflective of a company’s culture and employee experience. Currently, Colleen and her team are focused on telling the story of Squarespace’s unique, thoughtful, and design-focused culture, and bringing the Employer Brand and EVP to life across digital and experiential marketing channels. 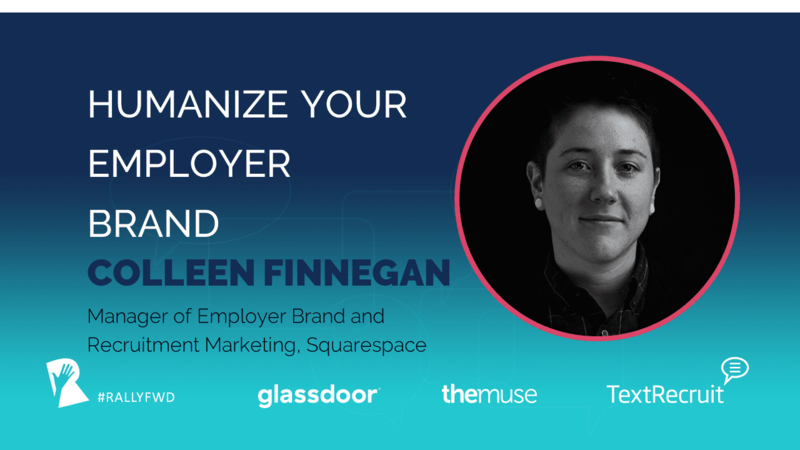 Prior to Squarespace, Colleen developed Pandora’s Employer Brand (“Life @ Pandora”) and led the Employer Branding, Recruitment Marketing, and Employee Engagement teams. While at Pandora, Colleen also led the LGBTQ+ Employee Resource Group, ensuring that the company supported the LGBTQ+ Community both internally and externally (i.e., scoring 100% on the HRC CEI Survey, supporting LGBTQ+ nonprofits like Lesbians Who Tech, MavenYouth, the LA LGBT center, and representing the LGBTQ+ community in consumer-facing marketing campaigns). Before making the career switch to Employer Branding and Employee Experience, Colleen managed large scale concerts and events for Pandora. She has also worked in digital advertising at Twitter, and as an account manager for venues and concert promoters at Sonicbids. Colleen has also been an independent concert producer, focusing on LGBTQ+ artists and dance parties. Colleen’s speaking engagements include SXSWi 2016, Northeastern University: Women’s Equality in the Music Industry (Panel), Medium LGBTQ+ Panel, and a DoubleDutch LGBTQ+ Panel. She also serves on the board of Maven Youth, an LGBTQ Youth Nonprofit that focuses on empowering LGBTQ+ youth to network, organize and educate for social change. The Muse is a sponsor of Rally. Their sponsorship fee helps us to provide educational content and events on Recruitment Marketing.